Summer is here! Well, almost… if you ignore the freak snowfall last week. The last few days have been gloriously sunny at least and it’s got me thinking about my summer plans. I don’t have any trips until September, and while that doesn’t mean I won’t end up on a train to Paris or a flight to Ireland for a long weekend, I also know there’s plenty I want to see in the UK. I read a great post the other day about dealing with wanderlust when you’re not travelling. 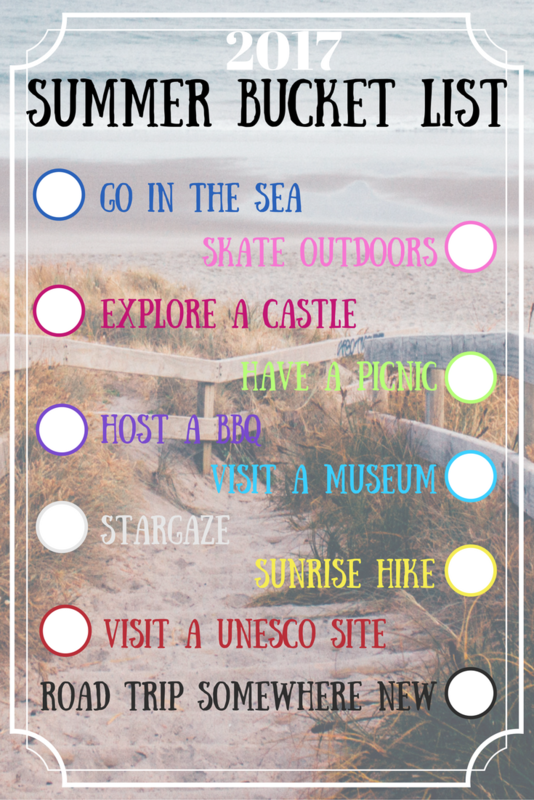 That combined with a couple of bucket lists on Pinterest inspired me to create my own summer bucket list for a staycation in the UK. I plan to make the most of every weekend with decent weather while it lasts, but this short list of ten things to do and see should make me focus on making the most of the summer even more! I’ll be aiming to tick everything off the list before I head to Bali in September, which gives me 4 months. Summer means beaches! Of course in the UK that doesn’t necessarily mean pleasant water to swim in. I’m a total wuss when it comes to cold water – but I will at least paddle in the sea once. And maybe build a sandcastle while I’m at it. Speaking of sandcastles… aren’t castles the best? The ramparts, the cannons, the tiny windows, the mini museums – I love it all. One of the great things about living in the UK is that there are castles everywhere so I’m spoilt for choice! My downfall when it comes to various attempts at vegetarianism. I don’t think there’s any better way to cook than over smoking coals while the sun shines. I didn’t use my barbecue nearly enough last year, must do better this summer! The best view of the Milky Way I’ve ever got was in the Sahara in Morocco. A remote village in Nicaragua was pretty damn good too. I won’t get close to that here, but I’ll be keeping an eye out for clear nights to drive away from the lights of my suburb to spend some quiet time staring up at the galaxy. World Heritage sites have been listed by the UN as a place of special cultural or physical significance – and there are 26 in the UK to choose between. I’ve already visited Stonehenge, Bath and several in London but that leaves plenty of scope for more! Blenheim Palace is close, or I could go further afield to Canterbury Cathedral or the castles of Gwynedd. This could be combined with a lot of the above ideas. If it’s warm out you don’t want to be stuck inside eating – so at some point this summer I shall pack up some yummy foods to wander somewhere for a picnic in the sunshine. Road trips are fun! Often I don’t have the flexibility of being able to drive myself around when travelling but it’s incredibly useful being able to explore at your own pace and stop wherever you fancy along the way. I might have a particular location in mind (there’s plenty on my UK pinterest board)… or I might just wing it. To be decided. What would be on your summer bucket list? This is a great idea. I do have one trip planned this summer, but there are a number of places close to home I’ve been wanting to see, and I just never seem to make the time for those. I think it’s time for me to make a list! Lists are great aren’t they? Making a list and sticking it up on a wall somehow makes it so much more likely that I’ll actually do the things I want to. Although pinterest boards are pretty good too for gathering ideas. I love your list! Great way to see and do heaps over the summer when you have no real travel plans. Being in the UK you’re lucky you’re never too far from a museum, world heritage site or beach. It was a lot of fun, but my legs hurt SO MUCH afterwards xD I’ve tried geocaching once and quite liked it, but it was in a place I already knew – I think it would be better for exploring a new place. Love this! I’m mad keen on promoting the fact that there’s more to see in the UK than London. I’ve started exploring the stuff on my doorstep more and more and I’m killing myself wondering why I haven’t done it before! I know, the places near me are never on a tourist map but there’s so much to see! I’m thinking about doing some itineraries for individual counties in the U.K. for slow travellers here, although it would need some collaboration because there’s just so many! Amazing. Can’t wait to read those! Keep in touch! A lot of these work for where I live (the Netherlands) as well — except maybe the part about climbing a hill. (We don’t have too many hills.) Sounds like a great summer to me! What a lovely idea to help dealing with wanderlust! Really good idea, often at home we forget how much beauty our own countries have don’t we. I live in Brighton and haven’t been swimming in the sea for 12 years, could be the summer to try it! Hehe I think so too! These are great ideas! i think people (me included) forget that there is just as much cool stuff to do at home as there is travelling. Now I just need the weather to get a bit warmer so I can start doing some of these!